One the best ways to spend a hot summer day in Beijing is to hit up one of the city’s many water parks. From man-made beaches right in the middle of the city, to a huge choice of slides and wave pools, Beijing has tons of options! It’s pretty cool to be able to go to a water park that is part of the Olympic complex. The Water Cube Water Park in located in the National Aquatics Park Center. A section of the Water Cube has been transformed into a whimsical indoor water park. The park has a wide range of products and services. The underwater fantasy park features smart temperature control for the perfect swim all year round. The park has more than 20 slides, fun music and light shoes, and a wave pool. 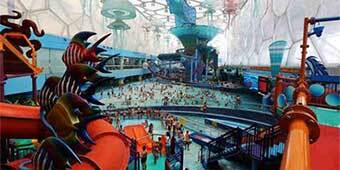 One of Beijing’s largest water parks, Morui Water World covers an area of over 35,000 square meters. The park’s theme is “North Hawaii.” The park has an awesome screen to watch movies while swimming, and the tallest water slide in China. Morui Water World also features surf simulation, a whirlpool, river rafting, and a splash pool and castle for children. For adults, the park has massage pools and spas. The City Seaview at Xiedao Resort is China’s largest man-made beach. The Chaoyang district park is tropical beach themed with a large wave pool and beach area. The park features coconut trees and beach umbrellas–the perfect summer escape in the city. Visitors can surf in the wave pool and lie on the beach to enjoy sun bathing. There is beach volleyball and soccer on the beach and a BBQ area and a bar. The resort features live bands and performances on weekends. When you get too hot and tired from lying in the sun, you can rest inside one of the many beach huts. Adults can play mahjong or watch movies. There are also water slides, fish ponds for adults and children, and other fun activities! Hujing Water Park is Beijing’s largest water park. Located in Huairou District near the western side of Yangqi Lake, the park can hold up to 15,000 people. The Caribbean themed water park has a tropical vibe, a wave pool, slides, river rafting, a splash pool for children, whirlpools, Jacuzzis, and more. How God awful! Couldn't think of a worse leisure time pursuit than bathing in 10,000 gallons of diluted Chinese kiddy piss. Eh I have a feeling everything one of these will be uncomfortably crowded. Will stick to my bathtub. Lol, be squashed like sardines in a tin amongst spitting and shouting Chinese and then pay for the pleasure? Thanks but no thanks!